Cello bags.com is the leader in cello bags and cellophane packaging for your bakery, candy, nuts or any small item need. We carry dozens of cello bag sizes and styles, biodegradable clear cello bags, flat and gusseted cellophane bags, printed cellophane bags and shrink wrap bags, just to name a few! An FDA approved safe food packaging material, cellophane bags are great for popcorn packaging, party favor bags, bakery bags, wedding favor bags or even cosmetic bags. Plus we have all the accessories you need to seal your packages including basket filler, twist ties, heat sealers. Add a pretty tag, bow or label and voila, your package is complete! 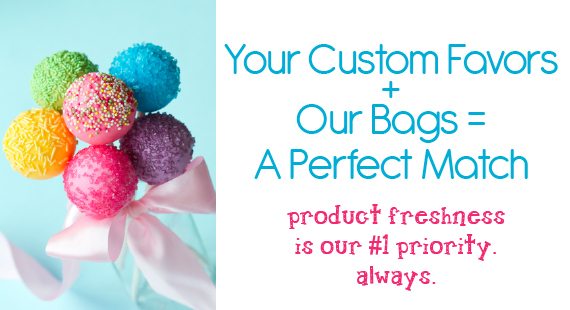 You've spent time & money making your product, why not show it off with Clear Cellophane Bags? Thank you again for visiting - we appreciate your patronage! Cellobags.com offers a wide selection of cello bags, cellophane bags, printed cello bags, shrink wrap bags, bakery bags, popcorn bags, deli containers, reclosable bags and cellophane bags accessories.